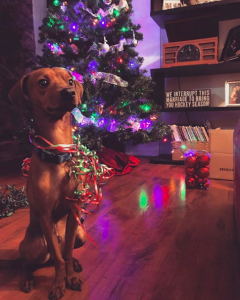 Happy Holidays from a finely decorated Murphy boy. This January, I adopted Murphy. He is a sweet, spastic, adorable, aggravating, two-year-old mutt. When I spotted him on the rescue agency’s “adoptable dogs” page (which I had been obsessively monitoring for months), I fell in love with his long spindly spiderlegs; his enormous baby deer eyes; his gorgeous auburn coat. Also, they mentioned that he was found in a field way out in San Bernardino County. My heart both broke and melted. The agency gave him the name Murphy, and I thought it suited the little guy perfectly. I didn’t overthink it. He’s Murphy. And now he’s mine. But the agency also gave me something that I just couldn’t sit with unchallenged. They guessed his breed to be an Italian Greyhound / Manchester Terrier mix. But I kept staring at his spindle legs, his doe eyes, his ginger fur. Thinking, “Is that right? Really? ?” He’s long like a Dachshund. He’s red like a Vizsla. He certainly is fast and skinny like an Italian Greyhound – but I knew that couldn’t be the whole story. These are Italian Greyhounds (left) and a Manchester Terrier (right) from previous Westminster dog shows. It’s not a bad guess for Murphy, right? After spending weeks speculating, Google image searching, and trying to stare deep into Murphy’s soul, I decided it needed to be settled once and for all. Enough wheel-spinning. I needed to get his DNA analyzed. I hear that veterinarians balk at dog DNA tests. They say they’re not reliable, not accurate, not relevant. But to reword the famous quote from statistician George Box: all data is wrong, but some is useful. Having some objective insight is better than none. But me being me, I couldn’t just stop at one answer. I, for some harebrained and probably wine-driven rationale, decided to buy two dog DNA tests. Even if they’re not reliable, I could see if they at least corroborated each other. So, after two mouth swabs, two eagerly awaited notification emails, and two emotional roller coasters (yes, I cried), I finally got the Murphy information I had craved since his adoption. Behold below: Murphy’s ancestry! Turns out, Italian Greyhound was confidently ruled out. Sorry, Murph, you’re just not that fancy. The agency’s original Manchester Terrier guess wasn’t bad, though, since it’s a breed that is related to one of his top breeds of Miniature Pinscher. The biggest shocker shouldn’t have shocked me. Of course this dude is a Chihuahua!! I live in Southern California. Chihuahuas make up 30%-40% of all shelter dogs in the state. By pure statistical chance, he’s more likely to be a Chihuahua than anything else. I’m guessing there’s some “adoption gaming” going on with the shelters and rescue agencies. If you can pitch that a dog is unique, he stands out to prospective adopters. If people are reluctant to get “a yippy Chihuahua,” it’s better to present your rescue pup as a more amiable, more exotic breed. I get it. I don’t hate the game. It’s frankly how Murphman caught my eye. Were these tests worth it? For me, 100%. I thrive on data. I flourish on learning. The DNA test didn’t change anything about Murphy, but it helped explain his various behaviors and instincts (so. much. defensive. barking.). But from a more visceral perspective? I think a lot about what Murphy’s life was like before I got him. Alone and stray in a field. Unneutered at one year old. Found with bite marks on his legs. Based on his reactivity when seeing strange dogs, he was probably neglected and poorly socialized. But these tests were a breath of fresh air. I now have some positive information about his life before me – his parents, his siblings, his genes. It just made me happy. Breed Breakdown Good if you want to know the *top* breeds. It's more conservative about what breeds it's willing to "guess." Good if you want lots of fascinating details about other, low-genetic-percentage breeds. Which may be a less accurate, but certainly more interesting. 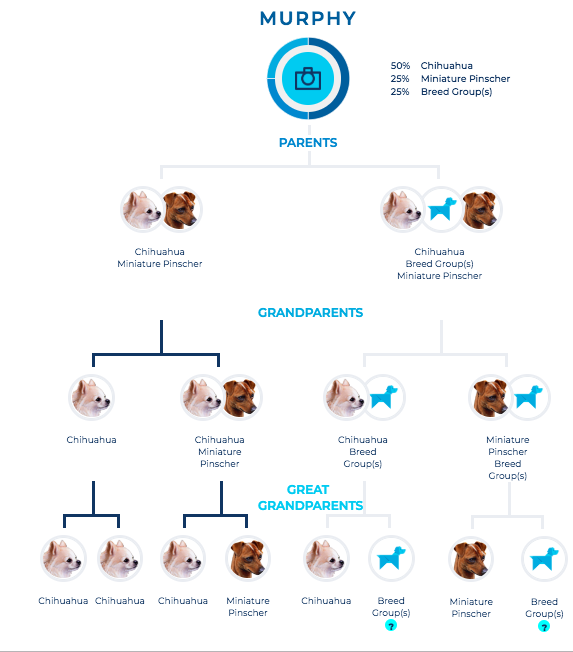 Community None that I saw You can opt to share your results, and find other dogs that have similar genetic profiles as your pup! Eeee! This feature is. the. best. I love love love the community feature in Embark. I don’t know why, but looking at dogs that look like Murphy sets off all my endorphins. I think it’s me trying to find the happiness in Murphy’s past. He has a family. He has relatives. Maybe he has siblings out there I can find. MAYBE. HE’S. A. DAD. I’m probably (absolutely) overly preoccupied with my dog. These tests are me injecting my obsession, writing this post is me feeding off the rush. I recognize my problem. Thanks for indulging me, dear readers. If you have questions about these tests, I’d love to share my experience. Comment below! Here’s Murphy’s family tree results from Wisdom Panel. Lots of Chihuahuas and Min Pins. And here’s the family tree from Embark. Both pick up Chihuahua and Min Pin “branches,” but this one throws a Poodle and a Pom in the mix! 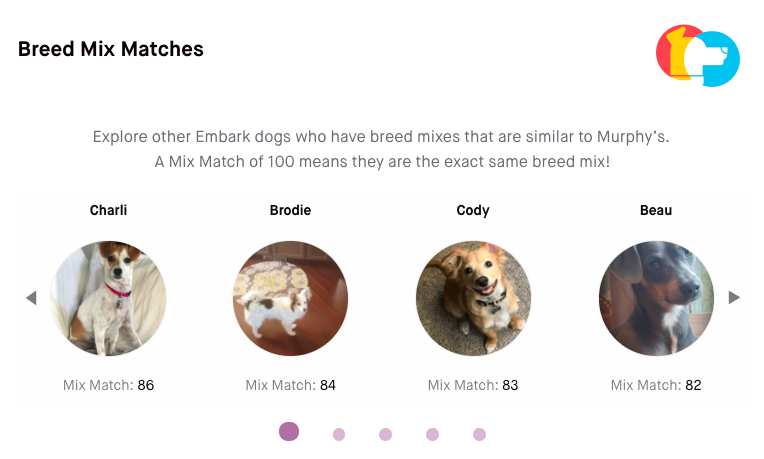 Embark shares the profiles of other dogs who have DNA like yours. And they all seem to be from Southern California, too. HI THERE GOOD DOGS. My Former Role Model is a Fraud. What Does That Make Me? Say Rent to the Tent?